And although dead, Sylvester the Pope of Rome lives. On the second day Sylvester breathed out his last breath. 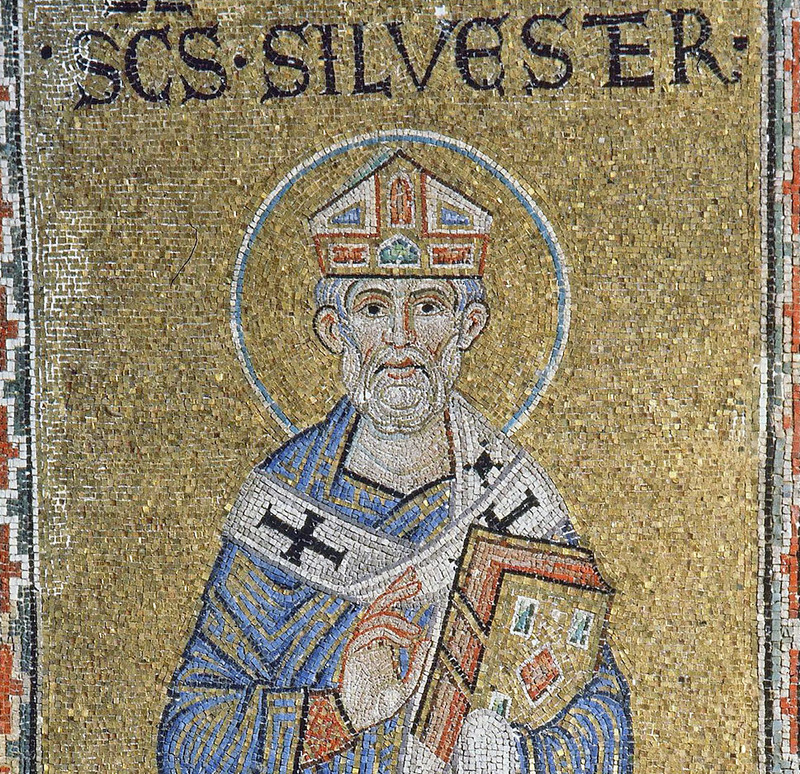 Saint Sylvester, Bishop of Rome, was born at Rome of Christian parents named Rufinus and Justa. His father soon died, and the Saint remained in the care of his mother. Sylvester’s teacher, the presbyter Quirinus, gave him a fine education and raised him as a true Christian. When he was an adult, Sylvester fulfilled the Lord’s command to love one’s neighbor. He often received strangers and travelers, serving them like a slave in his own home. 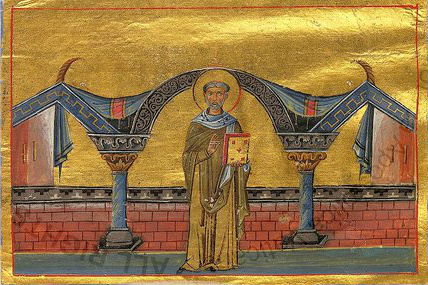 During a persecution against Christians, Sylvester did not hesitate to take in the holy confessor Bishop Timothy of Antioch, who dwelt with him for more than a year, and who converted many to Christ by his preaching. 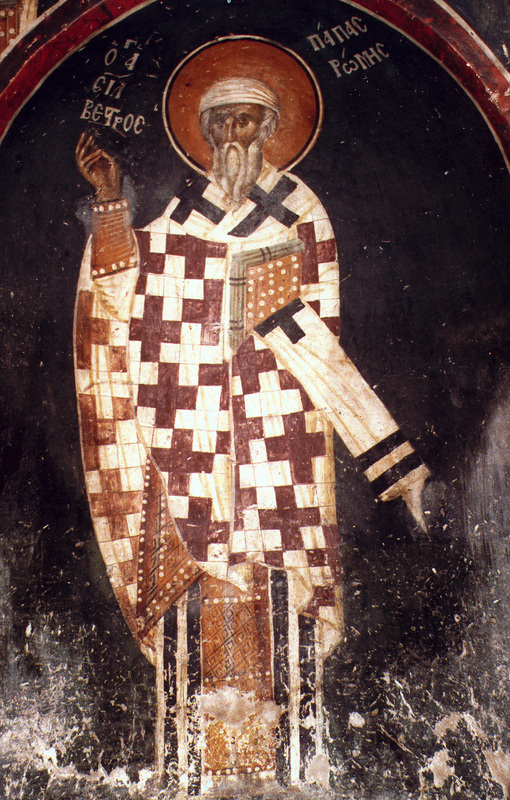 Bishop Timothy was arrested and executed on orders of the Prefect Tarquinius. Sylvester secretly took the body of the Saint and buried it. This came to the attention of Tarquinius, and the Saint was arrested and brought to trial. Tarquinius demanded that he renounce Christ, threatening him with torture and death. 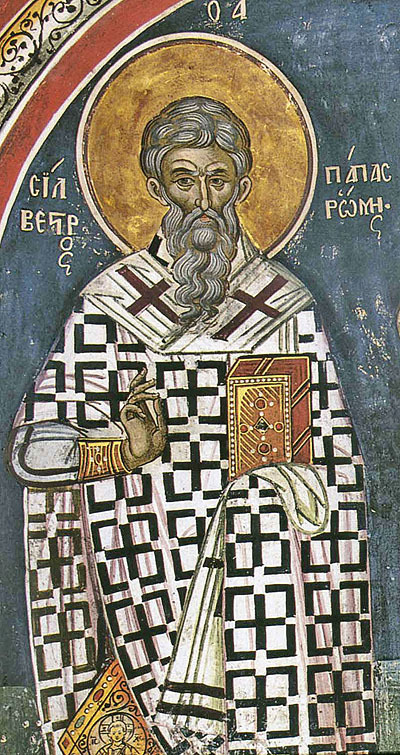 Saint Sylvester was however not intimidated, and he remained steadfast in his confession of faith, and was then thrown into prison. When Tarquinius suddenly died after the trial, the Saint was set free and fearlessly he evangelized the pagans, converting many to Christianity. At thirty years of age Sylvester, having mounted the pinnacle of virtue, was ordained as a Deacon, and then Presbyter, by Bishop Marcellinus (296-304). 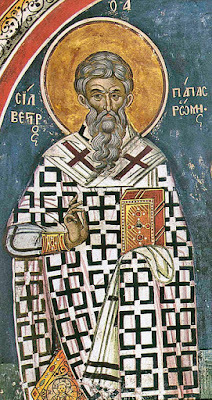 After the death of Bishop Miltiades of Rome, Saint Sylvester was chosen Bishop of Rome and ordained on 31 January 314. He encouraged his flock to live in a righteous manner, and he insisted that priests strictly fulfill their duty, and not be involved with secular businesses. Pope Sylvester became renowned as an expert on Holy Scripture and as a staunch defender of the Christian faith. During the reign of Emperor Constantine the Great, when the period of persecution had ended for the Church, the Jews arranged a public debate to determine which faith was true. Constantine and his mother, the holy Empress Helen, were present together with a large crowd. Saint Sylvester spoke for the Christians, and the Jews had one hundred and twenty learned rabbis led by Zambres, a magician and sorcerer. 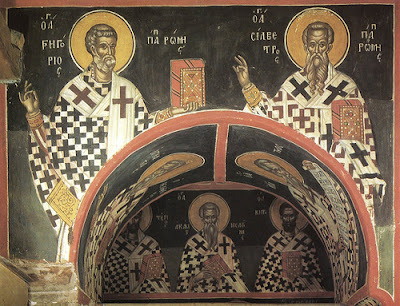 Quoting the sacred books of the Old Testament, Pope Sylvester convincingly demonstrated that all the prophets foretold the birth of Jesus Christ from the all-pure Virgin, and also His voluntary suffering and death for the redemption of the fallen race of mankind, and His glorious Resurrection. The Saint was declared the victor in the debate. Then Zambres tried to resort to sorcery, but the Saint obstructed the evil by calling on the name of the Lord Jesus Christ. For Sylvester raised a dead bull from the dead, which Zambres had killed and was unable to raise. Zambres and the other Jews came to believe in Jesus Christ, and they asked to be baptized. During his pontificate, the great churches founded at Rome by Constantine, e.g. the Basilica of Saint John Lateran, Santa Croce in Gerusalemme, Old Saint Peter's Basilica, and several cemeterial churches, were built over the graves of martyrs. 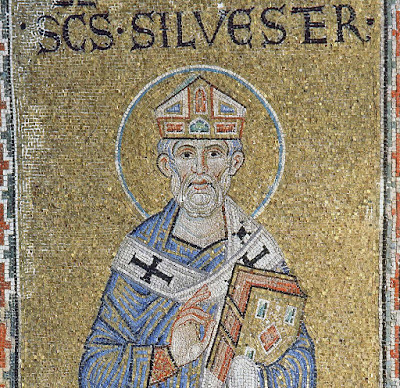 Sylvester did not attend the First Synod of Nicaea in 325, but he was represented by two legates, Vitus and Vincentius, and he approved the Synod's decisions. * Long after his death, the figure of Sylvester was embroidered upon in a fictional account of his relationship to Constantine, which seemed to successfully support the later Gelasian doctrine of papal supremacy, guiding imperial power, the doctrine that is embodied in the forged Donation of Constantine of the eighth century. In the fiction, of which an early version is represented in the early sixth-century Symmachean forgeries emanating from the curia of Pope Symmachus (died 514), the Emperor Constantine was cured of leprosy by the virtue of the baptismal water administered by Sylvester. The Emperor, abjectly grateful, not only confirmed the bishop of Rome as the primate above all other bishops, he resigned his imperial insignia and walked before Sylvester's horse holding the Pope's bridle as the papal groom. The Pope, in return, offered the crown of his own good will to Constantine, who abandoned Rome to the pope and took up residence in Constantinople. "The doctrine behind this charming story is a radical one," Norman F. Cantor observes: "The pope is supreme over all rulers, even the Roman emperor, who owes his crown to the pope and therefore may be deposed by papal decree". Such a useful legend quickly gained wide circulation; Gregory of Tours referred to this political legend in his history of the Franks, written in the 580s. The truth of the matter is that Constantine was baptized before his death in Nicomedia by Bishop Eusebius of Nicomedia, who is falsely called an Arian but was Orthodox. He was not baptized earlier because of his desire to travel to the Holy Land and be baptized in the Jordan River, but he was not able to accomplish this. The truth of things hath revealed thee to thy flock as a rule of faith, an icon of meekness, and a teacher of temperance; for this cause, thou hast achieved the heights by humility, riches by poverty. O Father and Hierarch Sylvester, intercede with Christ God that our souls be saved. As a companion of the holy ascetics, thou O God-bearer, hast been worthily shown forth as a true priest of priests before our King and God. Wherefore, thou rejoicest now with the choirs of the Angels, filled with gladness and delight in the Heavens, O Father. Renowned Sylvester, famed shepherd of Rome, save them that honour with love thy memorial.